p300 is a P2P utility to chat and share directories with other hosts on your network (and only there). Works with Windows, Linux and Mac OS X! 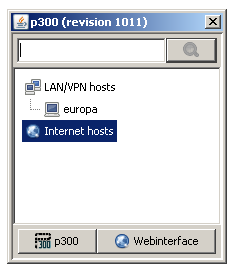 Automatic discovery of other p300 hosts via IP Multicast and IP Broadcast (UDP). PDA software and more by a friend of mine: just works! Cloud42 is a Amazon EC2 management tool written by a friend of mine. If you are interested in the ongoing development, you can subscribe to this feed and see when we are working on p300. Search function (currently only local and only in webinterface) Done in version 876! We are happy if you suggest more features.